In a breakthrough book first published in 1991, the authors address the dynamics in churches that can ensnare people in legalism, guilt, and begrudging service, keeping them from the grace and joy of Godbs kingdom.Written for both those who feel abused and those who may be causing it, The Subtle Power of Spiritual Abuse shows how people get hooked into abusive systems, the impact of controlling leadership on a congregation, and how the abused believer can find rest and recovery. 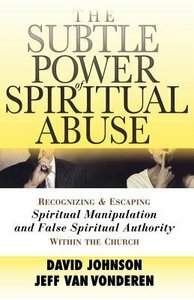 About "The Subtle Power of Spiritual Abuse: Recognizing and Escaping Spiritual Manipulation and False Spiritual Authority Within the Church"
David Johnson has been the senior pastor at Church of the Open Door in Maple Grove, Minnesota, since 1980. During this time, the church has grown from a congregation of 160 to 3,000 people. A much sought-after speaker, he is a graduate of Bethel College and received his theological training at Bethel Seminary and Trinity Evangelical Divinity School. His Growing in Grace radio broadcast in syndicated internationally. David and his family live in Minnesota. Jeff VanVonderen is a speaker and consultant in the areas of addiction, family systems and recovery. He is one of the featured interventionists on the Arts & Entertainment Network show Intervention. He is the author of Good News for the Chemically Dependent, Families Where Grace Is in Place, When God's People Let You Down, Tired of Trying to Measure Up, The Subtle Power of Spiritual Abuse and most recently with Dale and Juanita Ryan Soul Repair.